Psi Chapter of Sigma Nu at UNC - 5 Reasons to Come Home for Homecoming! STOP! Take 2 minutes to consider why you might give up a weekend to return to Chapel Hill to celebrate with your fellow Psi Chapter alumni. There are 5 reasons why you won’t want to miss Homecoming weekend, Nov. 6-8, as our Tar Heels take on the Duke Blue Devils in one of the nation’s oldest and most intense rivalries. 1. Food, Music & Good Times! This is an important weekend for Psi Chapter and UNC. So, we have put together a day of activities at the house to make sure you have a place to call home and to allow you to reconnect with your Sigma Nu brothers. We are still waiting for Saturday's kickoff time. Be sure to stop by the house for some good food and beverages, a chance to tell a few old stories and an opportunity to share some great fall football traditions with our active brothers. Watch your email for details next week once we have a confirmed schedule. This is your weekend! Let’s represent in true Sigma Nu fashion! We are making headlines. It is not because of scandals, inappropriate videos and social media, hazing or suspensions. We are in the headlines because we are leading the way on the UNC campus, across Sigma Nu and nationwide in our efforts to help our undergraduates become greater versions of themselves. 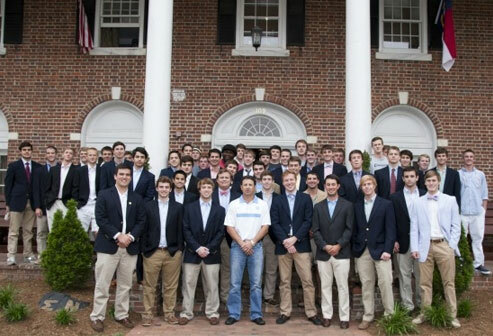 The chapter welcomed 27 new pledges this fall. Recruitment Chair Chris Batchelor ’18 is a college ambassador for Tilt.com, a new fundraising technology company. He is also an intern for another startup, InsideChef. Daniel Khordenforosh is the president of UNC INSPIRE, a “a volunteer placement organization that helps UNC students get involved in classrooms within the local Chapel Hill and Carrboro public schools system.” And there are many other examples. Let’s show our undergrads that we are proud of that stand they are taking on the UNC campus and across the nation! Your Tar Heels are currently 6-1. The Duke Blue Devils are also 6-1. So come back to Chapel Hill to watch a rivalry that has been in place since 1922. We lead with a 57-37-4 record (though Duke disputes the record by one game). Last year, we won 42-20. DON’T MISS THE GAME! AND MAKE SURE YOU REMIND YOUR BROTHERS to be there for what proves to be another memorable game! Homecoming is taking place just days before Veterans Day. We have begun compiling a list of our Psi Chapter alumni servicemen and veterans along with their stories. We need your help to build our list, tell the stories and pay tribute to these Sigma Nu brothers whose sacrifice exemplifies our motto of excelling with honor. CLICK HERE to review the list and to leave your comments. And if you see one of these brothers at Homecoming, please take a moment to express your gratitude for their sacrifice and service. Link to the Veteran article. 5. And Then There’s UNC Basketball!! Help the Tar Heels kick off their 2015-16 basketball season with an exhibition match against Guilford College which starts at 7:30 p.m. on Saturday night at the Dean Smith Center!